Cut or tear the mixed greens into small pieces. Put them in a bowl and set aside. Peel the oranges and cut them into small bite size pieces. Roast them with cumin, salt and pepper on a dry frying pan over medium heat. No oil is required as the oranges contain enough juice to prevent them from sticking to the pan. Cook the oranges for about five minutes. Take the oranges off the pan and add them to your bowl of greens. 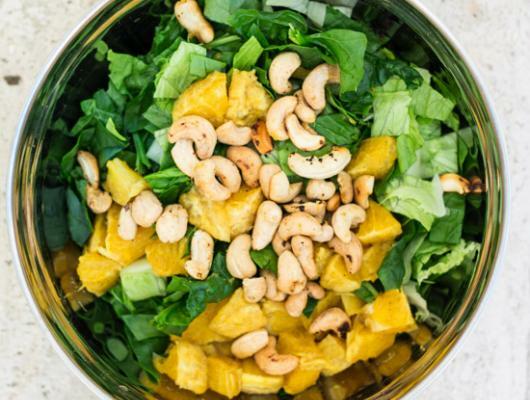 Roast the cashew nuts on the same pan for 3-5 minutes or until they are slightly golden. 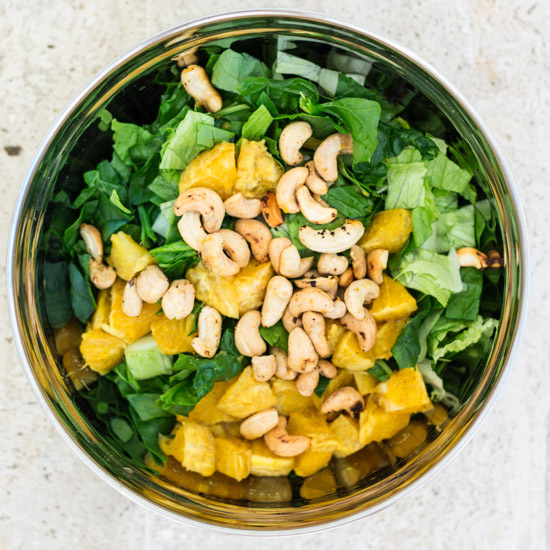 Take the cashew nuts off the heat and mix them with the oranges and greens. Serve immediately. This salad doesn't keep well even if kept in the fridge.